Aquaman may not be the coolest comic character on the shelves these days, but he’s close to it. And, with Ivan Reis doing the pages, he’s certainly the best drawn superhero out there. After Geoff Johns rebirthed Hal Jordan as Green Lantern, brought Barry Allen back as the Flash, and retconned a slew of other characters into something beyond what they’d EVER been, I shouldn’t be surprised that he could do the same for Arthur Curry. But I am. More than that, I’m totally amazed at the nifty mythology Johns has worked out for the character. The ability to redefine a character along the original baseline, then shore that character up with deeper emotional context and an enriched background story that shapes the future is one of Johns’s greatest strengths. He truly “gets” superheroes as human beings and what having all those powers/responsibilities would do to a person. Aquaman has got tons of backstory already built into him. I enjoyed the run Peter David had with the character years ago, imbuing Aquaman with a savage kingliness, but even that pales in comparison to what Johns is doing. This Aquaman, this Arthur Curry, is a man I admire and respect and like. He’s one step away from being alone in the world, a true “fish out of water,” which will probably get me shot, but is exactly the case. Aquaman in this first volume of new adventures isn’t the king of the sea or the king of Atlantis. He’s a guy living in a lighthouse in the town where he grew up with his dad, and he’s trying to figure stuff out. Of course, while he’s doing that, new menaces like the Trench rise up and old, confusing relationships like Dr. Shin and even memories of Arthur’s father rise up to complicate matters and put the pressure on. Mera, as the love of Aquaman’s life, has never been shown in a better light. She is wild and deadly, as turbulent as the storm-tossed waves, but she loves Arthur and that relationship is one of the strongest cornerstones of this new series. She is an alien creature, to Arthur, to the citizens of Amnesty Bay, and to the reader. 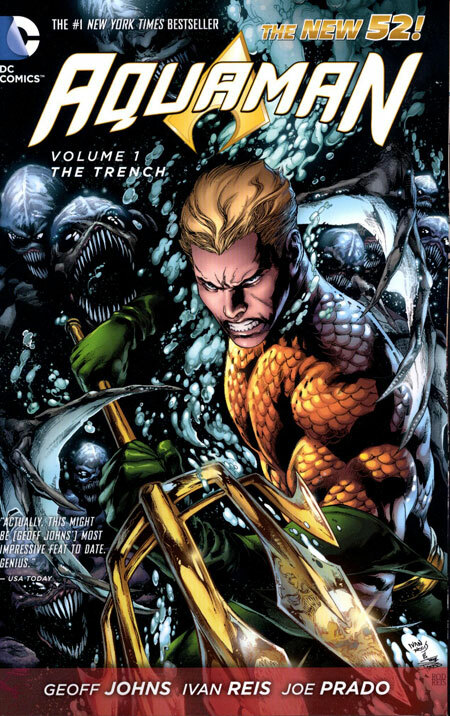 This collection features a four-issue run that deals with the Trench, which reminded me of Pirahna 3D because of the way the creatures had been locked away and feeding on each other. And they reminded me a bit of the Black Lanterns from the Green Lantern books. However, they are a great villain for Aquaman because they are of the sea, they’re fierce, and they’re confusing because he is torn between destroying them and saving them. The story plays out well, but I really don’t think we’ve seen the last of them. Not all of the questions have been answered. 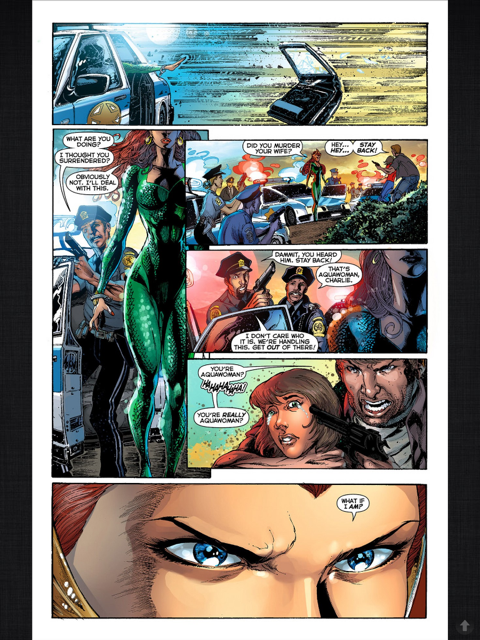 The graphic novel fills out with two “solo” adventures of Aquaman and Mera. In the first, we get a prequel to more high drama to come that arrives in the form of an Atlantean “black box” that carries a mysterious message. In the second, we get an even better look at Mera, at her powers, the way she views the human world, and a troubling look into her past that will eventually become a stumbling block for her and Aquaman. Ivan Reis is the best comics penciller out there in my opinion. The guy just churns out beautiful pages filled with action and emotion, and the colorists working on this book are powerful and vibrant. 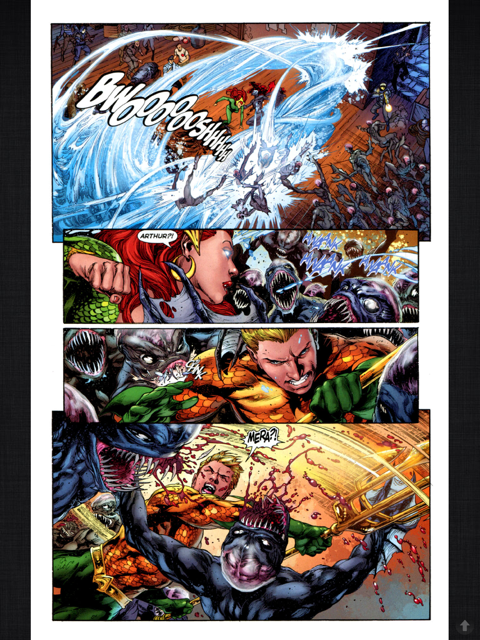 If you haven’t checked out Aquaman in a while, this is a great place to start. 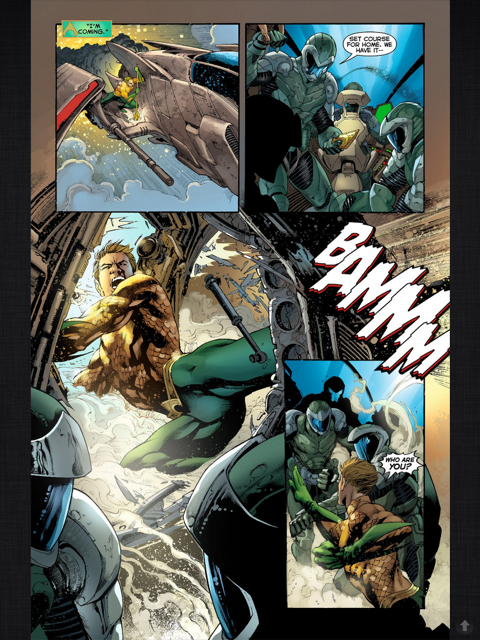 And if you are familiar with Aquaman, you’ve never seen him like this before. This entry was posted on July 16, 2013 at 8:14 pm and filed under Adventure,comics,DC Comics,Graphic Novel,Juvenile,series fiction,Superhero,Young Adult. You can follow any responses to this entry through the RSS feed. You can leave a response, or trackback from your own site.